Last month I flew from New Zealand to Tonga with my family. About half an hour before the end of the journey a tiny, dark green island appeared in the westward-facing windows of our aircraft. Two fang-like rocks rose beside the island, and white water recoiled silently from its high cliffs. I was soon shouting excitedly, jumping out of my seat, pacing up and down the aisle of the aeroplane, and leaning over strangers' meal trays, as I searched for the best view of the island. One of the strangers looked at me strangely. "I'm sorry if I seem overexcited" I told her. "I'm just very interested in the island out that window. It's called 'Ata and I've been researching its history, but I've never seen it before". The stranger smiled unenthusiastically, and I retreated to my seat feeling chastened. Over the past few weeks, though, I've realised that I'm not the only person who is fascinated by the tiny island that sits in the ocean between New Zealand and the inhabited parts of the Kingdom of Tonga. When I gave a lecture in Nuku'alofa about the raid on 'Ata by nineteenth century whalers-turned-slavers from Tasmania and New Zealand, the audience was larger and more enthusiastic than I'd expected. Well over two thousand people have read the text of my lecture, in the fortnight since I posted it on this blog. Many Tongans have shared a link to the lecture on facebook, and over at the Proud to be Tongan facebook group three hundred and twenty-four people have 'liked' the lecture. I've had e mails and other messages from dozens of people who want to talk about 'Ata. I'm very grateful for this response. The lecture I gave in Nuku'alofa focused on the slave raid of 1863, and the way it forced the abandonment of 'Ata, but there are many other, less tragic aspects of the island's history that are both fascinating and - to me, at least - mysterious. In this post I'd like share five questions about five different parts of 'Ata's history. Perhaps some of the same readers who have been giving me insights into the slave raid of 1863 can help me to answer these questions. 1. What happened to the people who made 'Ata's pots? In 1921 the anthropologist Edward Gifford visited 'Eua, the island where survivors of the slave raid on 'Ata had been resettled in the 1860s. These survivors told Gifford stories about the history of 'Ata, and helped him draw up an 'Atan genealogy. Gifford published the stories and the genealogy in his 1929 book Tongan Society. Gifford was told that 'Ata had been populated by three separate small groups in the eighteenth century. According to one story Gifford heard, the first of these groups of settlers discovered a small number of 'aboriginal' inhabitants on the island, and burned them alive in a cave. When the archaeologist Atholl Anderson surveyed and excavated 'Ata in 1977, he discovered the remains of a village that had been established sometime around the eighteenth century. But Anderson also found shards of pottery, of the sort made by the Lapita people who settled Tonga as long as three and a half thousand years ago. An archaeologist named William Dickinson has tested the fragments of pottery found on 'Ata, and found that they were made from local soil, rather than imported from another part of Tonga. Anderson and Dickinson's research suggests that at least a small number of people were living on 'Ata long before the eighteenth century. What happened to these first 'Atans? Did they die out or emigrate before later groups arrived, or were they usurped by the settlers who arrived around the eighteenth century? Did their memory survive in the story Gifford heard about a group of indigenes who perished in a cave? 2. Did 'Atans have distinctive physical features? 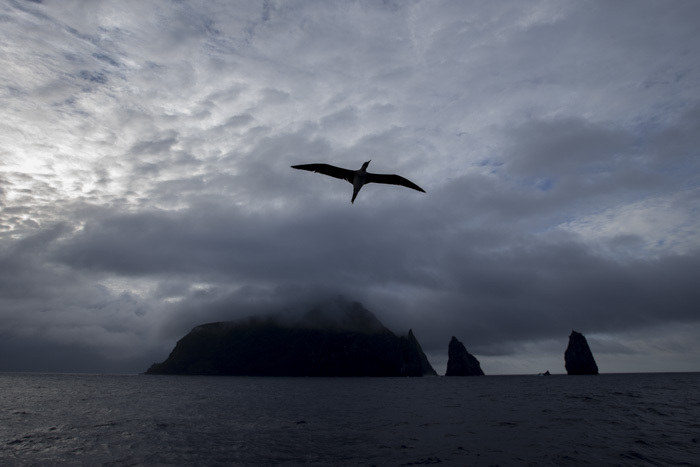 Some of the Pacific's smallest islands are more isolated from the rest of the world today than they were in the nineteenth century, before the advent of air travel and container shipping. Often nineteenth century mariners would use remote islands like 'Ata as navigational aids, and sometimes they would stop at these islands to gather supplies or make repairs. Some remote islands boasted surprisingly cosmopolitan populations, as men who had arrived on sealing or whaling or naval vessels settled down and produced children. 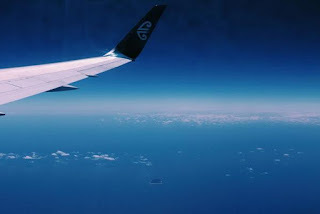 Michael King has noted that the Chatham Islands, which sit in the cold and empty ocean between southern New Zealand and South America, were home to people from around the world in the first half of the nineteenth century. The appearance of some of the Atta [sic] men I met in Tonga made me think they had white blood in their veins. One, whose good services as a cook made pleasanter many of the pleasant days I spent in Tonga, might sit for a portrait of an old Spanish don - over 6ft high, with high narrow forehead, long face, aquiline nose, keen, dark eyes, thin lips, peaked beard, black, almost straight, hair, long neck, and spare muscular frame, hands and feet very small and neat. This man, nearly 60 years old, used to say that long ago a ship came to Atta [sic] and put some white men on the island, and he was descended from one of the men thus left. Some of the descendants of 'Ata I talked with recently on 'Eua insisted that their ancestors had looked different from other Tongans. Several claimed that 'Atans tended to have brown rather than black hair. The genealogy published by Edward Gifford suggests that cross-cousin marriage was much more common on 'Ata than in the rest of Tonga. If a few outsiders settled on the island and produced children, might these outsiders' physical traits spread quickly through the population, given the frequency of cross-cousin marriage? 3. Did Charlotte Badger visit 'Ata? 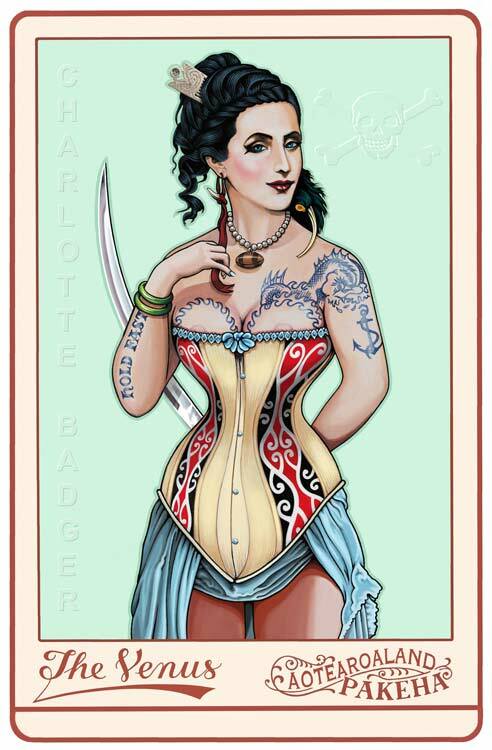 Charlotte Badger was a thief, a pirate and, in all likelihood, the first white woman to live in New Zealand. Badger grew up in Britain but was sent to New South Wales at the beginning of the nineteenth century after being convicted of breaking into a house. In 1806 Badger, her baby daughter, and a group of other, mostly male convicts were put on a ship called the Venus, which was headed for the penal town of Hobart. The prisoners took over the ship, and sailed it across the Tasman to New Zealand, where British law had little purchase. During the rebellion Badger is supposed to have dressed as a male and whipped the captain of the Venus. Later she apparently robbed another ship of its stores at gunpoint. Badger and several other colonists settled in the Bay of Islands, close to a Maori community. Badger was offered passages back to New South Wales, but she maintained that she would rather live amongst Maori than be hanged by her own people for helping to steal the Venus. But Badger may eventually have left New Zealand, and visited 'Ata on her way to a new home. In 1826 a whaling ship called the Lafayette stopped at 'Ata, where its crew were told that another ship had visited about a decade earlier. According to the 'Atans who talked to the Lafayette, the earlier ship's passengers had included a woman and her daughter. The mother was tall and fat, and her daughter was about eight years old. The mother had told the 'Atans that she and her daughter were fleeing from Maori. Christine Badger was a large woman, and her daughter would have been about eight years old in 1816. Many stories claim that Badger eventually settled in more northerly parts of Tonga, or else went on to America, but no evidence has emerged to clarify her fate. 4. Was 'Ata a last refuge for Tonga's pagans? In 1854 Charles St Julian, a journalist for the Sydney Morning Herald and advisor to the Kingdom of Hawa'ii, published an article called 'The Friendly Islands'. Near the end of his text St Julian turned his attention to 'Ata, which he described as a 'rather barren spot' with a population of one hundred and fifty. St Julian said that 'Ata was 'still heathen', and claimed that Tupou I intended either to 'bring back' its people or else to 'convert them to Christianity'. By 1854, Tupou I had used guns and the Bible to unify Tonga under his rule. 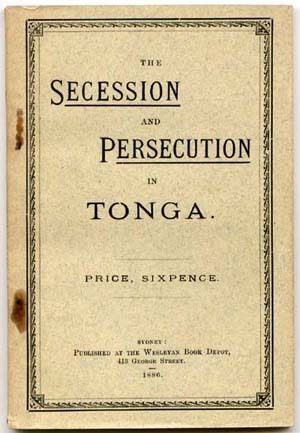 Only two years earlier he had besieged and defeated the Tongatapu villages of Pea and Houma, whose people had rejected both his right to rule Tonga and his Methodist faith. Until 1852 some of the people of Pea and Houma had held on to Tonga's old, pre-Christian religion. They visited godhouses where kava-drunk priests channeled the voices of ancient deities like Hikule'o, and they danced in ways that upset Tupou I and his missionary mentors. If St Julian's article is correct, then 'Ata was the last stronghold of paganism in Tonga. And oral history suggests there may have been some connection between 'Ata and the siege of Pea. According to the stories that Edward Gifford collected on 'Eua in 1921, 'Ata's village was named Kolomaile, and was divided into three sections, which were named Hihifo, Auloto, and Pea. The name Pea referred, Gifford was told, to the village of Pea on Tongatapu. Another of Gifford's informants, who had links to the Tu'i Tonga dynasty, told a story set in the year 1852 that linked Pea to 'Ata. According to the story, a god named Moalaleki resided in Pea, and helped to protect the village. But this god became angry when a cup of kava that should have been drunk by a warrior named Sialevaila was given to another fighter. He deserted Pea and went to 'Ata, bringing with him a kava root. The 'Atans already had houses and priests devoted to a couple of other deities, but they happily accepted Moalaleki, chewing and drinking the kava he had brought. On the very day that Moalaleki left Pea, Tupou I began his siege of the village. Tupou I's military campaign was, according the story Gifford heard, punishment for the treatment of Sialevailea and the loss of Moalaleki. Is it possible that the story Gifford heard about Moalaleki and Pea recorded, in an imprecise and metaphorical manner, the flight of a group of refugees from Pea to 'Ata? Did some of Tonga's embattled pagans seek refuge from Tupou I's crusade, and from infighting in their own village, on the kingdom's remotest island? By the time of the 1863 slave raid 'Ata boasted a Methodist church, which missionary John Thomas describes visiting in his History of Tonga, but the date and manner of the islanders' conversion from paganism to Christianity are obscure. 5. Why weren't the fakaongo interned on 'Ata? By the middle of the 1880s King Tupou I and his powerful Premier, the former missionary Shirley Baker, had turned against the Methodist church, denouncing it as an agent of British imperialism. Tupou left the international Methodist movement and founded his own Free Church of Tonga, which he ordered his subjects to join. Most Tongans obeyed their king, but a minority refused. These dissenters were called fakaongo, or submissive ones, by Tupou I and his supporters. Hundreds of fakaongo were beaten, and some were driven off their plantations. After six young men tried and failed to assassinate Shirley Baker in February 1887, the Tongan government announced that the fakaongo would be sent into exile. According to an article that appeared in an Australian paper in March 1887, many fakaongo were visited at their homes by police on the 20th of February and told to prepare for deportation to 'Ata. Some fakaongo who had not been sentenced to deportation applied to the government for permission to travel with their fellow Methodists to 'Ata. In April 1887 Australian newspapers published a letter from James Moulton, a Methodist minister who was resisting Baker and Tupou I's attempts to drive his church from Tonga. Moulton explained that a group of fakaongo had recently left Tonga on a ship. The government had persistently told the fakaongo that they would be sent to 'Ata, but the vessel had instead taken them to Fiji. 'Ata had been uninhabited for decades, but its tiny size, rough coast, and lack of food would have doomed many of the fakaongo. The persecution of Tonga's Methodists had upset many people in Australia and New Zealand, and Tonga's government may have been worried about the response from the British Empire if the fakaongo were left to die on 'Ata. Perhaps Shirley Baker avoided populating 'Ata with fakaongo because he wanted to turn the island to some other, more profitable purpose. According to an article published in 1889 in the New Zealand Herald, Baker negotiated with a number of palangi who wanted to lease the island and turn it into a sheep station. New Zealanders had run a huge sheep farm on 'Eua for much of the 1870s and '80s, until they fell out with Baker, whom they accused of wanting to take over their business. In 1890, after pressure from Britain and the international Methodist movement, Baker was deported from Tonga, and the fakaongo returned from Fiji. Interesting history. Ata was inhabited a long time ago by Lapitan culture and after Tupou and his allies imposed their religious 'empire' it was uninhabited. But between the Lapitan and then it could have been inhabited by these quite different people: it is possible that the Charlotte Badger was there. She clearly didn't want to return. The link by Anonymous is informative. Maui and his father were busy fishing up Islands for sure! Fascinating idea of Niue emerging when those concerned in raising it stamped on it, sounds like something rich and strange from one of John Pule's poems or his novel 'The Shark that Ate the Sun' (Ithink his poems are better as on Jack's NZ Poets in Recording or whatever it is, his novel I found started like a fascinating saga but dived off into a kind of magic realism: but there is no doubt about the writer's ability...! The link by anon also shows the interconnection between say Tonga, Samoa, Fiji, Niue and other Islands. Ata was fished up (according to the myth), it is volcanic but that is all covered in the discussion by Nunn. By chance, clearing out my books I had for sale I have 'History and Geography of Tonga' by Wood and I picked up an ex-library book from GI called 'World's Apart: A History of the Pacific Islands' by Campbell that looks interesting. My son just went last month for a 10 day holiday in Samoa. He went to both main Islands. It was a great experience for him. Hi Scott. Thanks. He went with his mother, my ex wife obviously, who is part Samoan. I'm not sure her rational for travel, although they did pass through the village her grandfather was born. Vic tends to learn things through seeing them on YouTube or hearing about them as do many people so he took in what was said by their guide but he picked up that there were a hell of a lot of churches, and he felt that the Samoans there were more friendly and laid back than here. It is hard to see they gain much coming here, my neighbour on one side is Samoan and was waxing lyrical about green bananas...Vic found out about Stevenson, of whom they think quite highly and he is called Tusitala. I had thought he had been in Tahiti but mixed him up with Gaugiun. Vic also went to Australia a few years ago something he organized himself which was incredible considering the set backs he has had...So, yes, it was an adventure. He has now gone to almost more places outside NZ than me! All my family except me have been to Australia...one sister goes to India to try to convert Muslims!! She is Christian of course (it's strange as, in a strict sense, I think my brother and older sister are atheists (altho Dennis married a Thai woman years ago so took an interest in Buddhism), and my brother goes to a lot of places...I have a niece in Las Vegas so he goes there, or travels around Aussie or NZ camping whereas I, well I go almost nowhere except to book shops (second hand), my chess club, coffee bars, or the odd book launch!! But in the 70s, to go to Australia, you just needed to pay at the airport. No passport needed so I should have gone then. I think you had to have a visa though, not sure, but it has got more complex now I think. Yes, the teaching of History, at least insofar as it stimulates interest, is important. We did get stuff about NZ which was good. I think nowadays in NZ at least more is taught (but, in general, there is (or there was) tendency for us to concentrate on European history, I suppose we all have to realise we need to be prepared to learn all our lives, I am 67 and I look at Scott's things here, and think: "Oh no, more about Tonga." But then I start reading and it's like a magical history. I think if the teacher is inspired by say the history of Tonga and Polynesia, then it inspires his pupils. There may also be, with some Tongans, a tendency to value the British and European cultural things and to push the idea that it is superior etc which is sad as that idea is nonsense. When the Europeans came they brought a lot of absurd ideas on morality and religion, as well as diseases. In fact the 1918 flu epidemic was kindly spread by New Zealanders and others and killed hundreds or thousands of Tongans. So I think there is as much to learn from Tonga...NZ seems to find it's culture in rugby and in following the absurd and destructive wars of the last 150 years, which were all stupid. Meanwhile they and the US conducted military and nuclear tests on many of the Islands. British companies ripped many of the islands apart for the superphosphate fertilizer for lands denuded by greedy white settler here who ripped off the Maori big time: and the superphosphates and run off are now polluting our own rivers), and our so called civilization has not really done much for Tonga (or NZ) so I would say we can learn more from Polynesia than they can (or you can) from us. Of course there are the odd things, like flush toilets, the greatest of all human inventions! Never thought something like this could happen. Hopefully, it will never happen again. What do you think of Writersperhour.com website? Thank you both for sharing Holy Mass with us each day http://www.fnafsisterlocation.us http://www.fnafsisterlocationminijuegos.com http://www.friv2018.us to make yourselves available http://www.frivtwizl.com http://www.jeuxdetwizl.com http://www.juegosdefnafsisterlocation.com when we were called out late at night and any other time and for your support and encouragement in every respect. http://www.juegosfriv2021.com http://www.twizlgratis.com http://www.ujuegos.com http://www.juegosdetwizl.com die Informationsgesellschaft in der Schweiz voranzubringen. Thank you both for sharing Holy Mass with us each day http://www.fnafsisterlocation.us http://www.fnafsisterlocationminijuegos.com http://www.friv2018.us to make yourselves available http://www.frivtwizl.com http://www.jeuxdetwizl.com http://www.juegosdefnafsisterlocation.com when we were called out late at night and any other time and for your support and encouragement in every respect. http://www.juegosfriv2021.com http://www.twizlgratis.com http://www.ujuegos.com http://www.juegosdetwizl.com Thank you for sharing with me a few of your ideas regarding the possibility. Adorei esse artigo! Seria mais legal que inserisse para melhor a compreensão do que está sendo dito. Clique aqui, você obterá o mais atualizado recurso para a compreensão dessa matéria.